Riparian buffers prevent erosion, improve water quality, and build the resiliency of native habitats. Native trees and shrubs intertwine with one another, keeping 350-acres of flood plain intact along the banks of the Winooski River, best known as the Intervale. Located within the city limits of Vermont’s urban metropolis (42,000), Burlington boasts a solid urban farming culture, much due to its relationship with the Intervale Center, the non-profit responsible for stewarding the 350-acres of Winooski River bottomland. Riparian buffers protect the ecosystem along the Winooski River at the Intervale in Burlington, Vermont. Photo by Rachel Carter. The Intervale’s deep roots draw from a classic historical friction between agricultural and industrial growth. Abenaki farming evidence dates back to 1450, followed by controversial Vermont state founder, Ethan Allen, building a homestead and then selling some of the land. Railway tracks were laid in the 1860s and dairy farming took over in the 1900s. A municipal dump opened in 1944 and operated through the 1970s. Illegal dumping continued into the 1980s until Burlington was rezoned to exclude industrial and residential growth in 1987. A few years prior, Gardener’s Supply Company was founded on the adjacent property and by the time the new zoning laws went into effect, farming was back at the Intervale and began Vermont’s first CSA in 1989. The Intervale Center leases affordable farmland to local farmers, operates a food hub, provides educational, community, and farm viability programming, and promotes healthier lands and water with the Intervale Conservation Nursery. Mike Ingall’s reaches for one of the Intervale Conservation Nursery’s popular trees, the alder can take higher levels of pollution than other species and is good nitrogen fixer. Photo by Rachel Carter. 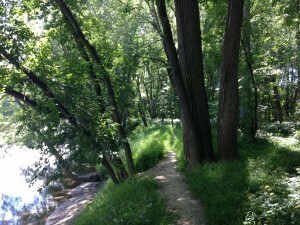 A canopy of native trees and thick layers of shrubs embrace the buffer between the river and urban farmland, giving a dark and dewy jungle-like feel as you walk through the trails along the Winooski River. The damp atmosphere not only encourages healthy walking habits to keep pace ahead of the mosquitos, but the intensive root system created by the trees and shrubs protects the river from environmental impacts by creating a stable bank that is resistant to erosion and capable of filtering sediments and pollutants before they reach the water. It’s no accident the Intervale’s flood plain has been restored with native species like silver maples and ostrich ferns, compared to the debris that littered the bottomland 20 years ago. Officially known as riparian buffers, the restoration of river banks with native species places the Intervale Center’s Conservation Nursery in the limelight. 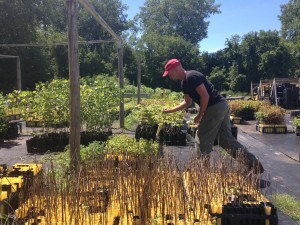 Operating as a social enterprise within the Intervale Center, the Conservation Nursery grew and planted 95 acres of native trees and shrubs in 2015 for riparian buffer zones and storm water management projects for landowners, farmers, watershed organizations, conservation districts, and government agencies. The nursery also participates in the Conservation Reserve Enhancement Program – a USDA and Farm Service Agency initiative to take farmland in high-priority areas out of production and put into conservation in exchange for annual rental payments. Recent Intervale Conservation Nursery projects include creating a buffer of 350 trees and shrubs along a small creek flanked by corn fields adjacent to the Quiet Path in Stowe, Vermont. The creek runs about 500 yards before it empties into West Branch of the Little River. The Quiet Path is part of the Mayo Farm, a 235-acre property conserved by the Stowe Land Trust. Hurricane Irene led to a series of projects around the state including plantings along the Mad River in downtown Waitsfield in partnership with 350.org and Friends of the Mad River. Financial support for many of these projects comes from Vermont-based coffee company, Keurig Green Mountain. 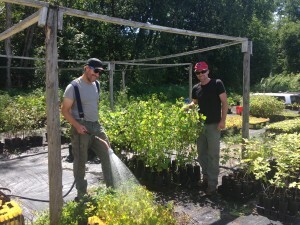 Seth Gillim and Mike Ingalls are managers of the Intervale Conservation Nursery, founded in 2002 and dedicated to growing native, locally sourced trees and shrubs for riparian restoration projects throughout Vermont. Photo by Rachel Carter. Everything grown at the Intervale Conservation Nursery is started from seeds collected directly from nature and cuttings at the nursery. Ingalls emphasizes this is the most viable method to source seeds. The Conservation Nursery operates in a niche market with bear root, soilless trees which are much more affordable compared to container trees for landscaping. All plants are grown ecologically, using no fertilizers, pesticides, or herbicides. Cover cropping and organic mulch from leaf litter prime the soil with nutrients. “We live with the weeds rather than spraying or sterilizing our soils,” shares Ingalls. On the endangered species list, butternut used to be a valuable food source. 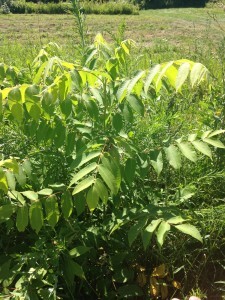 The Intervale Conservation Nursery is working to grow butternuts that might be canker resistant. Photo by Rachel Carter. Vermont is in the hot seat when it comes to water quality issues. The Intervale Conservation Nursery plays a critical role in helping to restore Vermont waterways. Native trees prevent erosion and help filter sediment and nutrients from entering lakes and streams. Additionally, the community education that accompanies all of the Intervale’s work is instrumental for the collaborative work taking place in Vermont to build the resiliency of the working landscape. Vermont’s statewide Farm to Plate food system plan to strengthen the farm and food economy, improve environmental quality, and increase local food access for all Vermonters is in its fourth year (out of ten) of implementation. Vermont’s Farm to Plate work draws connections between diverse stakeholders and provides space for difficult conversations to take place so larger scale, system change work can be accomplished over time. Several goals of Vermont’s Farm to Plate Strategic Plan call for farm viability and profitability, environmental stewardship, and land conservation balanced with availability to grow more food for Vermont’s entire population. Organizations like the Intervale and enterprises such as the Conservation Nursery play one very distinct role in Vermont’s commitment to work together to strengthen the working landscape. Learn more about The Intervale at www.intervale.org and Vermont Farm to Plate at www.vtfarmtoplate.com.